I’m speaking to Entrepreneurs who have yet to make a consistent, comfortable living from your business, whether you’ve been at it for 6 weeks or 6 years. And you still can’t even ask for the sale, which is the only way you will ever make money. It’s because there’s safety in being the student. It’s another thing to go out and slay them. Decide if you’re a librarian, or a gladiator. At least the librarian can be happy knowing he’s a librarian, surrounded by the books he loves. Needs to suit up and slay something to be happy. Dying in the library would be a slower, more painful death than anything he’s likely to encounter on the battlefield. 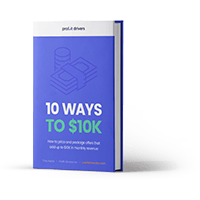 For entrepreneurs who want to become Business Gladiators, or at least have help getting over the hump of asking for the sale, you can download my FREE, SHORT, EASY-TO-DIGEST report, “10 Ways to $10k, which you can access via the optin form on this page. (top right on desktop, scroll down on mobile.) It was created for entrepreneurs making $0 to $300k a year. It will help you with mindset, clarity, and things you may not even have thought of, without causing information overload.